The M60 looks, at first glance, very much like the M48 designed five years earlier, and for good reasons. It was nothing more than an evolution of the type but modified too extensively in too many ways to be considered by the US Ordnance a simple version of the latter. The OTCM (Ordnance Technical Committee Minutes) #37002 officially standardized the type as the 105 mm Gun Full Tracked Combat Tank M60. It was not officially named “Patton”, but it was the first officially named as a “main battle tank”, and not a medium tank. For three decades, the M60 was the workhorse of the US Army, USMC, NATO’s and Allied or affiliated nations to the western block around the world. With more than 15,000 built over a large period of time, modernized in various ways, it was still in service in the US in 1997 and is still frontline with many armies in the world today, a testimony to the soundness of the original design. 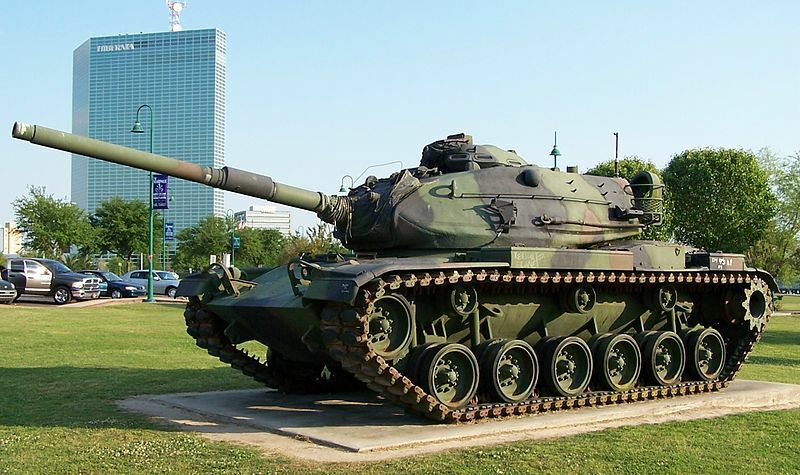 Although considered very much like a 1st generation MBT, it was modernized as a 2nd generation MBT, on par with its European counterparts of the sixties, the British Chieftain, German Leopard and French AMX-30. Now it is retired from US service, but some specialized variants are still active. In a general way, the M60 is very much an upgraded M48 and had the same issues and advantages which kept it in service for such a long period of time, even long surviving the introduction of the more advanced M1 Abrams. The M60 was criticized for its high profile and lack of cross-country mobility compared to European models, but it was also roomy and comfortable, proving time and time again its extraordinary aptitude to be upgraded, as well as its reliability and ruggedness. 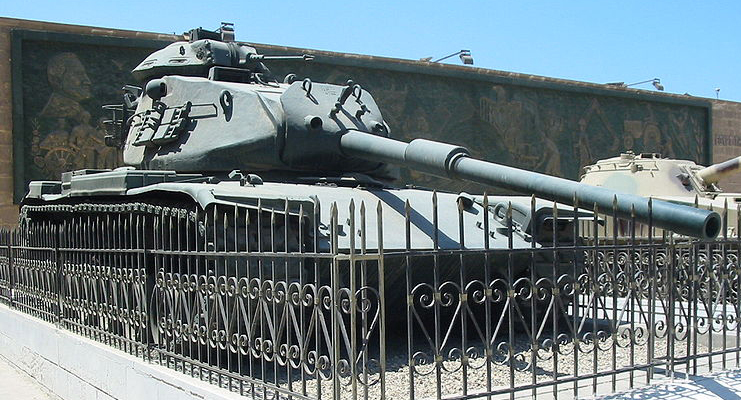 The M60 mostly owes its existence to a singular event, the capture of Soviet T-54A, driven onto the British Embassy gardens at Budapest during the 1956 Hungarian revolution. It was recovered and sent to NATO’s top brass and experts. Live ammunition firing tests showed not only that this tank could withstand the British 20 pounder of the Centurion or the American 90 mm (3.54 in) of the M47 and the new M48. Therefore, the Royal Ordnance L7 was quickly designed and became NATO’s standard tank gun for years. The British decided that all future modernization and new tanks will be based on it, leading to discussions between Germany, Italy and France for a future “Europanzer”, which would also use the gun. In the USA it was decided to adopt the gun for mass production under license. A new platform was quickly designed around the new M68 tank gun, largely based on the M48A3. It was to be named M68 (like the cannon) in 1959 when the first prototype was tried, but the Ordnance Bureau renamed it the M60, according to the year of acceptance. 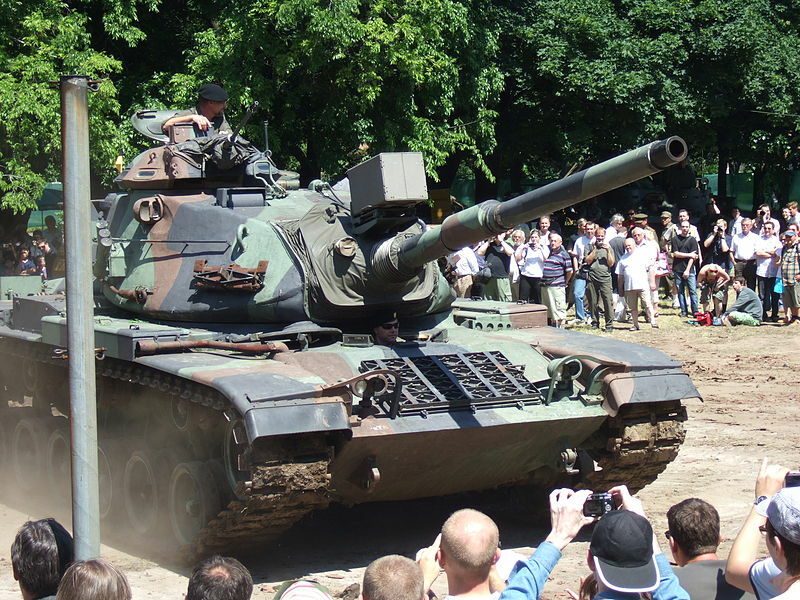 In 1963, the initial model was replaced by the M60A1, which would be the production standard until 1980. Studies for a better-protected tank with a 105 mm (4.13 in) gun started in 1957. At first, the hull was a one piece steel casting divided into three compartments, with a straight front slope and beak (the M48 had a rounded one). However, the bottom hull was still “boat-like”, with a pronounced recess between the upper tracks and external suspension arms. The armor was improved, at 6 inches (155 mm) on the front glacis and mantlet of solid rolled homogeneous armor, while it was 4.3 inches (110 mm) on the M48. 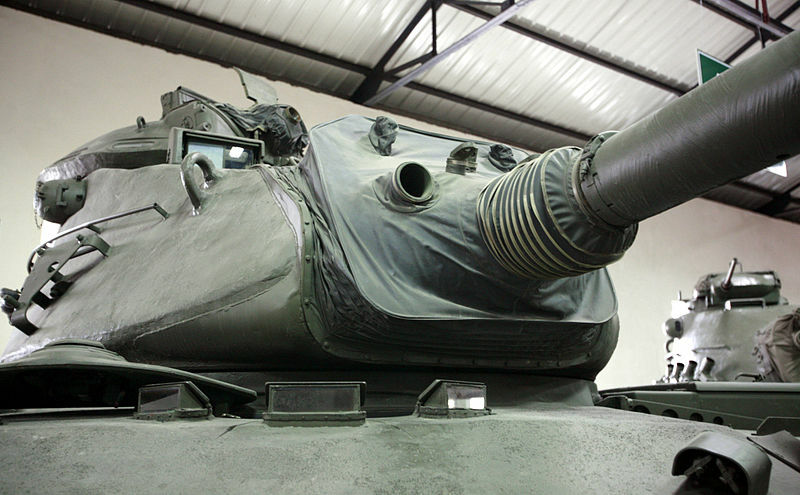 The M60 was the last American tank using this RHA, 1st gen. tank armor formula. Despite the added weight of the engine, armor and new gun, the tank was only two ton heavier, at 50.7 tons versus 48.5 tons of the M48A1. The driver sat in the middle of the flat portion after the glacis slope and had three day periscopes. The central one would be replaced by an infrared vision device. He had an escape hatch under the hull, in case of an evacuation if the gun would block the upper hatch. His own access to the turret was restricted, as the turret needed to be turned backward. Armor scheme progression by version/ degrees of inclination (version) *equivalent of RHA. The turret had a clamshell shape, similar to the one on the M48, but it was changed in 1963 to the distinctive “needle nose” design of the M60A1, which made for a narrower front cross-section, minimizing the surface offered to enemy fire. This allowed optimizing the layout of the combat compartment, as this turret was more elongated and significantly roomier, for the same central width. The earlier production M60s did not have any commander cupola. It was added in the form of a heavy commander cupola/heavy machine-gun turret, with the hatch on top. This particular arrangement, which reminds of the old M3 Lee, allowed the commander to operate the cal.50 (12.7 mm) machine-gun from inside, fully protected (see later). Although provisions for additional pintle mounts were made, the main auxiliary weapon of the tank was this HMG. The coaxial cal.30 (7.62 mm) M73 acted as much as a targeting device as an anti-personal close defense system. The arrangement was typical of US tanks of the time, with the gunner on the front right and the commander right behind him, while the loader was on the left-rear hand side. The turret roof was characterized by this massive “secondary turret” on the turret’s right, which counted a beak mantlet at the front with the main periscopic sight above, a one-piece, hinged at the top-rear hatch in the middle, and six vision blocks with bulletproof glass on the sides and rear. Three welded handles allowed this turret-cupola to be lifted for repairs and maintenance. 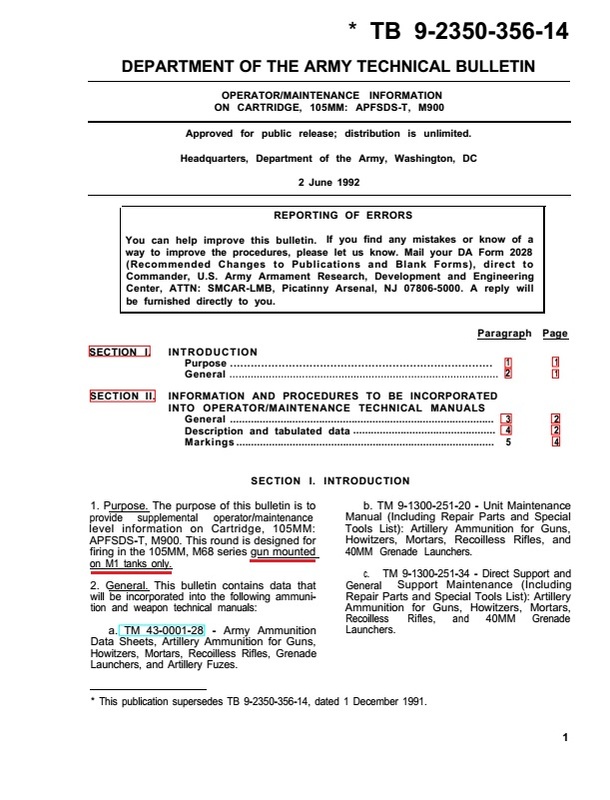 This was dictated by NBC measures as well as for the tank commander’s protection when firing his weapon and especially in an urban environment. Compared to the M48 similarly-arranged turrets featuring the classical “Ma Deuce” cal.50 (12.7 mm), the M60 cupola was given the M85, a revised 12.7 mm (0.5 in) derived from the M2HB HMG, but modified for AA defense. Thanks to the much more compact dimensions and being horizontally-fed, the M85 could fit more easily inside the cramped cupola forward space. But experience showed that due to this tight fit and excessive vibrations, the mounts had tendencies to break up. It was also a high, obvious target, but provided much better protection than the M48 cupolas, as shown by the injuries reports. Tanks commander could better brace themselves during brutal cross-country maneuvers. 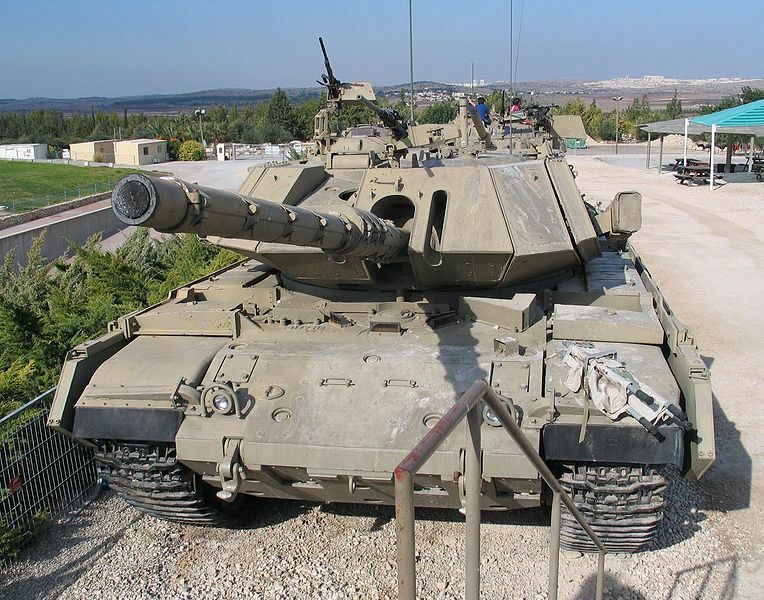 At the end of the production, on the M60A3, the design reverted to a lower, more conventional “Urdan” type (Israeli influenced) cupola. The next M1 Abrams also eliminated this feature to revert to a lower profile. The single-piece, hinging backward loader’s hatch was located on the left-hand side on the roof. A mushroom-shaped fume extractor took place at the rear left of the turret bustle. The firepower is provided by a bore evacuated 105 mm (4.1 in), 52 caliber M68 rifled tank gun derived from the British Royal Ordnance L7. A real improvement over the previous 90 mm (3.54 in), it gave almost twice the range, with much greater accuracy and far better muzzle velocity. It is characterized by its 1/3 down length placed bore evacuator with a specific eccentrically mounted extractor and an American vertical sliding breech block. Not only the gun could share standard NATO ammunition of the HE, Frag, AP, HEAT types, but it could be replaced by foreign-supplied models if needed in combat conditions, because of its full compatibility. It could fire at an average of 10 rounds per minute (maximum) with a well-trained crew. 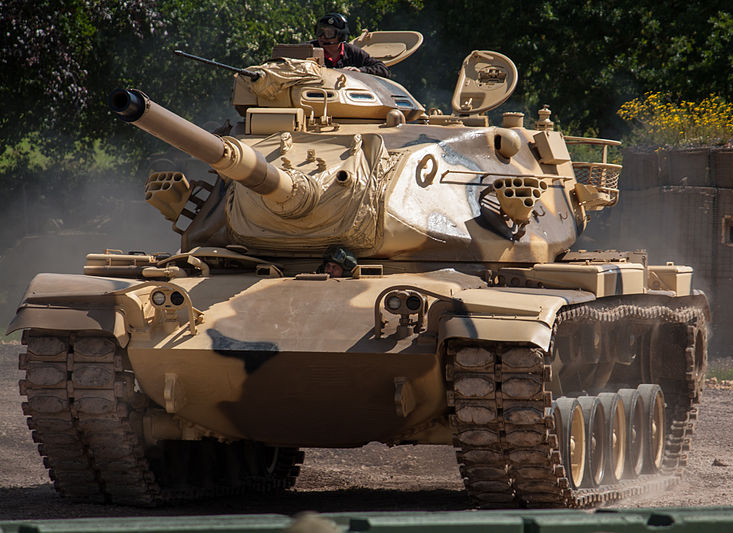 The M68 was standard until the mid-1980s when the M1 Abrams swapped it for a 120 mm (4.72 in). It was complemented by a coaxial M73 0.3 cal. (7.62 mm) machine gun and an M85 cal.50 (12.7 mm) took place on the roof, inside the commander cupola’s smaller turret, which allowed him to fire while being protected. Round storage was distributed between the turret bustle, a few ready rounds of various types were fastened and accessible for the gunner, and the rest was stored inside safe containers on the hull floor. The M60A2 introduced a 152 mm (6 in) missile gun. The engine was a Continental AVDS-1790-2 V12, air-cooled twin-turbo diesel engine, which provided 750 bhp (560 kW), giving a power to weight ratio of 15.08 bhp/t, compared to the 810 hp gasoline engine of the first M48 version. This change was required after seeing the M48 plagued by its short range in operations. The diesel almost doubled the operational range, and to put it like the American tankers of the 1960s did, “now the army has legs”. This new power unit was served by a single-stage, cross-drive Allison CD-850-6 transmission, combined with differential steering with 2 forward and 1 reverse ranges, and braking unit. This powerpack was reliable and, although not giving tremendous speeds, nor cross-country mobility prowess, was appreciated by the drivers for its ride smoothness. Closeview of the M60 running gear. The drivetrain was identical to the one on the M48 with one exception, it counted only three return rollers, versus five on the M48, and the roadwheels were cast in aluminum, and not in steel, a weight-saving measure. However, this made them slightly more fragile, and costlier, so spare steel roadwheels were kept. There were six paired roadwheels on each side, for a total of 24, all rubberized. The front idler was an un-ruberrized roadwheel pair. The back drive sprocket were identical to the standard model. The tracks were also identical and equipped with rubber shoes. This was the first major version and mass-production model, characterized by a new “needle nose” turret. The latter was not adopted immediately, and a significant number still fielded the M48A3 turret. It was in service since the spring of 1962. As it was at least two tons heavier, this forced the adoption of a shock absorber on the second roadwheel pair and was also accompanied by a slight relocation of the first return roller. The Continental engine was now the AVDS-1790-2C, served by the Allison CD-850-6A powershift cross-drive transmission. Other minor internal modifications were made to the hull. Early M60A1s had no gun stabilization system. An AOS or add-on-stabilizer was retrofitted in the early 1970s, enhancing first hit killing rate by keeping the gun close to the aim while on the move. Protection was improved (thanks to reports from the 1973 war) with the adoption of add-on chin armor for the turret. In the engine, a new hydraulic fluid prevented the danger of internal fire by lowering the point of ignition. 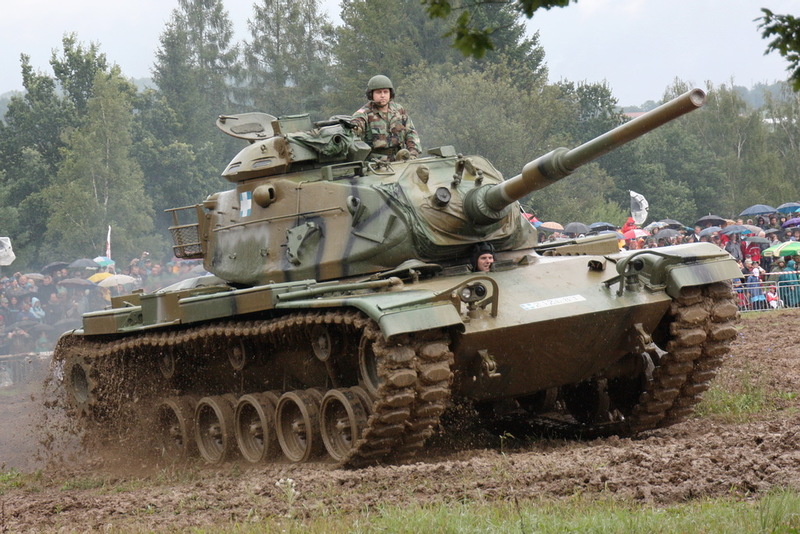 In 1974 and 1975, these tanks were upgraded with RISE (Reliability Improvement of Selected Equipment), consisting in a new engine configuration, and in 1977, the RISE/passive appeared. It consisted in the adoption of passive IR sights for the driver, gunner and commander. The need for a massive IR illuminator above the gun was therefore eliminated. In 1978-79, a battery of two smoke dischargers banks was fitted on either side of the turret. The M60A1 was also retrofitted with the M60A3 T142 tracks with replaceable trackpads. But by the 1980s, after these upgrades, the M60A1 was only distinguished from the M60A3 by its lack of crosswind sensor, armored flap of the TTS and thermal shroud for the main gun. These tanks formed the backbone of the US armored forces until the M1 Abrams became operational. At 58 tons, the late A1 was much heavier than the M60 (50.7 tons), or the early A1 (52-54 tons), thus reducing its mobility. In 1966 General Dynamics Land Systems designed a new low profile turret, equipped with a 152mm Gun/Missile Launch system. The new turret was mated to a 105mm Gun Tank M60 hull, creating the M60A2, unofficially nicknamed the “Starship”. Though the vehicle was one the most technologically complex of its era, this also contributed to its failure, largely due to difficulties with maintenance, training, and complicated operation. Work on a vastly enhanced version began in 1978, at the same time the M1 Abrams program began. This was chiefly to keep the M60 in operation alongside the much costlier new main battle tank, and to be able to face off the T-64 and T-72. Although the hull and turret remained unchanged for the most, it was easily distinguished by the fitting of two banks of smoke dischargers, an AN/VVG-2 flash-lamp pumped ruby-laser based rangefinder, an M21 ballistic computer and a turret stabilization system. At mid-production, it was also decided to delete the cupola. This was done for three reasons. 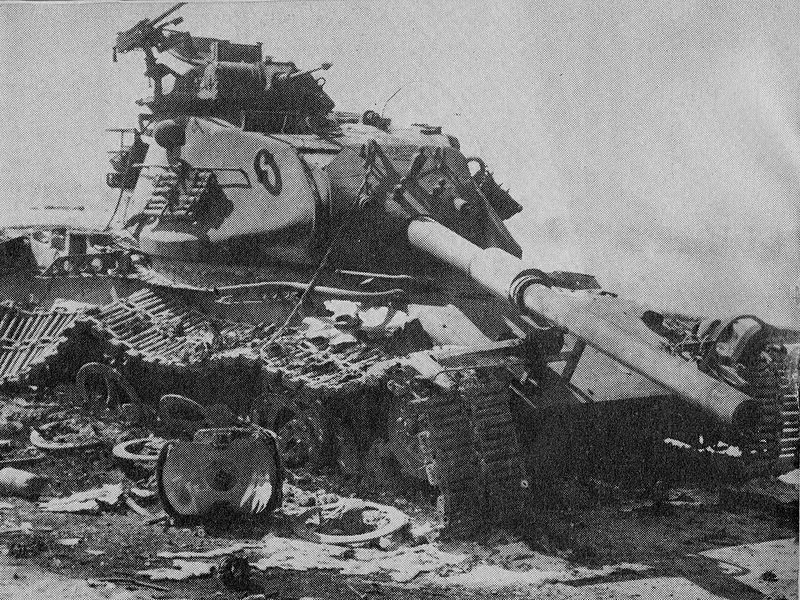 Israeli studies on their own M60A1/A3s in combat (IDF tactical doctrine imposed that the commander fight unbuttoned, exposed) showed that a non-penetrating hit on the turret roof, burying itself at the base of the cupola (acting as a shot trap) could dislodge it, instantly killing the commander. In addition, the locking mechanism of the hatch was dangerous to use under fire. The performances of the remote-controlled M85 heavy AA MG as originally intended were even worse than those of the pintle-mount cal.50 (12.7 mm), due to limited elevation. 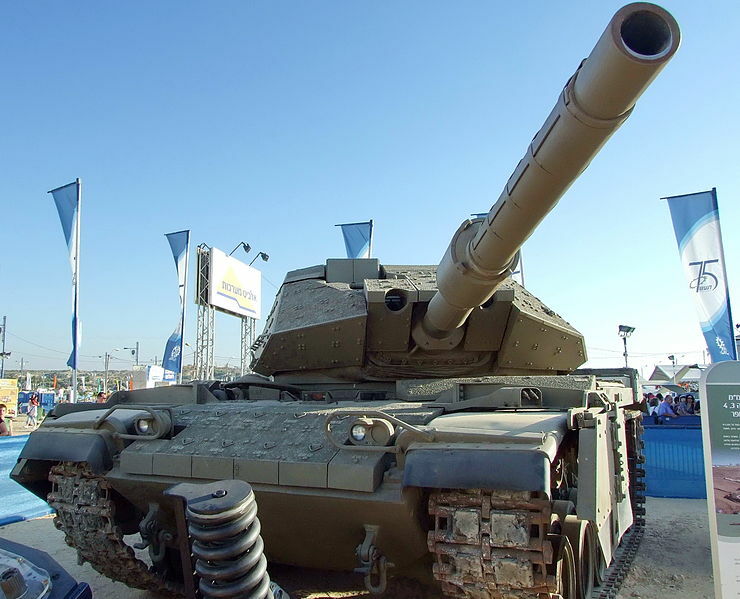 Therefore, late versions are recognized by their low-profile, simpler “Urdan cupola”, and the overall silhouette of the tank was greatly diminished in the process. The service duration of the M60A3 was impressive, spanning two and a half more decades, from 1980 to 2005. This was due to a number of factors, that made it compare well with the much more advanced M1, especially from a cost and maintainance point of view. The infantry telephone on the back plate was still on the M60 but was eliminated on the M1 and later retrofitted with TUSK. Although having lower performance, the M60 engine was much cheaper to maintain, more fuel-efficient and had also a lower temperature. It was, therefore, less dangerous for infantry marching behind. The floor escape hatch, absent on the M1, was also an added safety feature for the crew, if the tank was turned over or under enemy fire. Indirect fire was also easier on the M60 and allowed a more variety of operations in coordination with infantry. So, in tactical doctrine, the M1/M60 rôles were refined and well distributed. 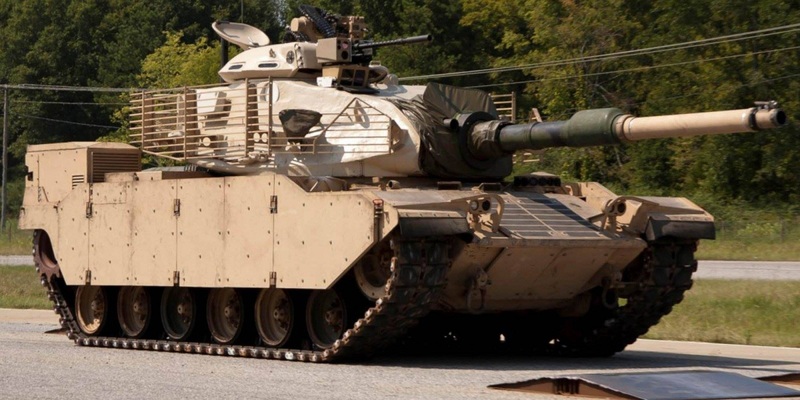 The M1 Abrams was to spearhead the armored assault and deal with enemy tanks, while the M60 was to follow with infantry to clear and sanitize the area, especially in an urban environment. 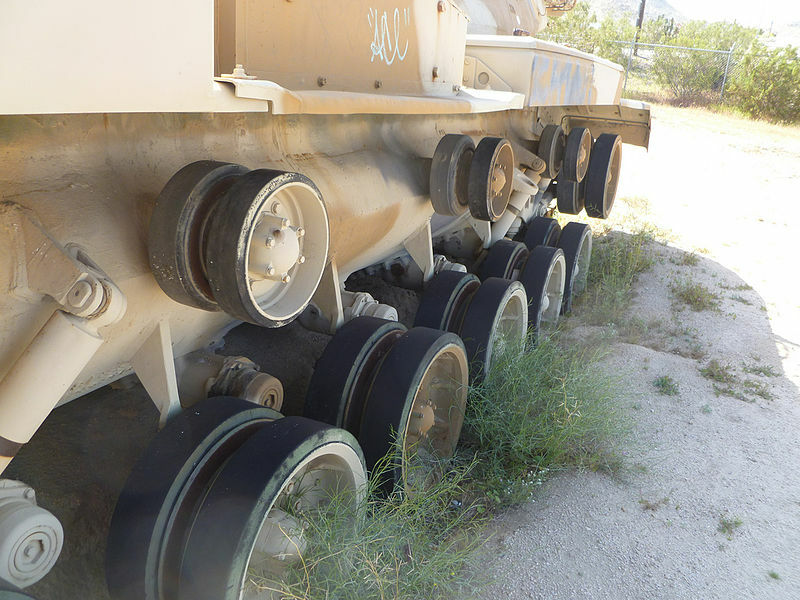 However, both tanks were equally sensitive to IEDs. 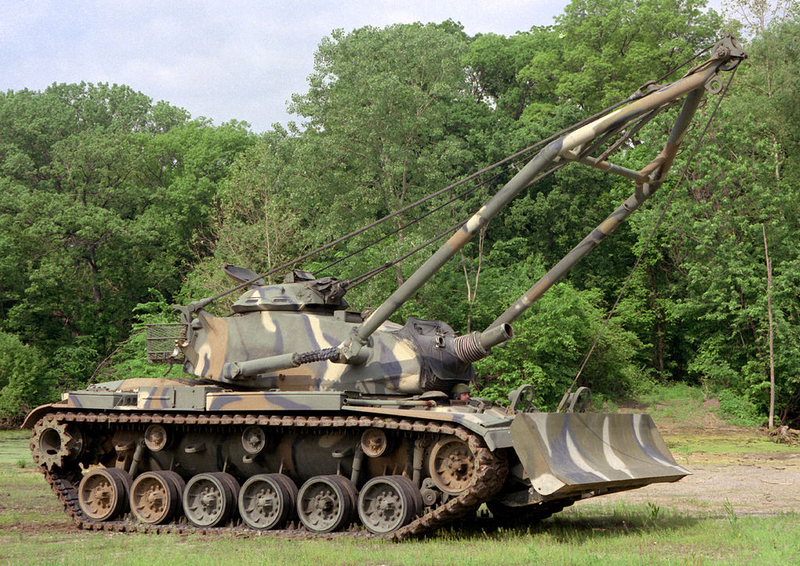 105mm Gun Tank M60 equipped with a mine plough on training at the Quantico USMC base. The M60A1 AOS: Stabilization of the M68 gun introduced in 1972. M60A1 RISE: (Reliability Improvements for Selected Equipment). Upgraded engine design for easier access and removal and sturdier T142 track type. M60A1 RISE Passive: Smaller infra-red/white capable search-light and passive night vision devices. ERA was added in the late 1980s. 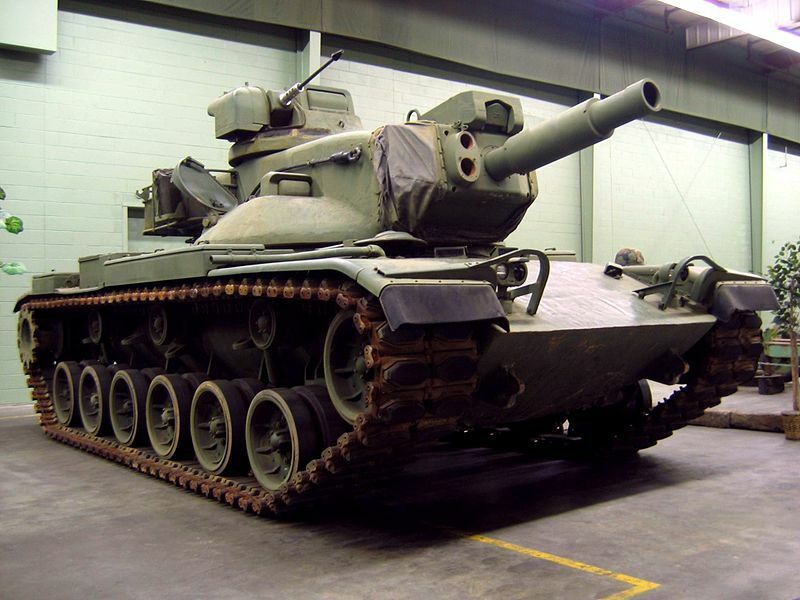 M60A1E1: The experimental prototype which tested a new turret for the 152 mm (6 in) M162 cannon. Led to the M60A1E2, then M60A2 “Starship”. M60A1E3/E4 prototypes with a new 150 mm (5.9 in) gun and remote-controlled weaponry. M60A3 TTS: Fitted with upgraded AN/VSG-2 thermal sights. M60 super/AX: Featured additional protection. 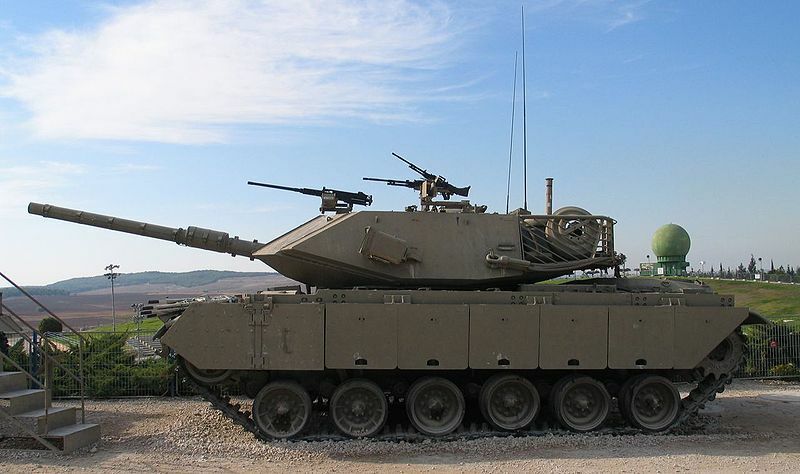 M60-2000 120S: A hybrid with M1 Abrams gun and electronics, tested, but not adopted. 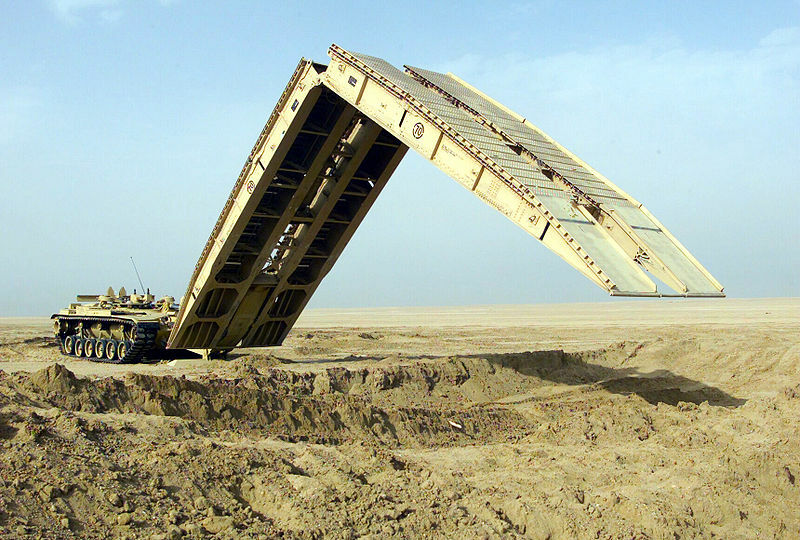 M60 AVLB: The scissor-stype 60 feet (18 m) span bridgelayer, later upgraded on the M60A1. M60 AVLM: Armored Vehicle Launched MICLIC (Mine-Clearing Line Charge). M60 Panther: Remotelly-operated mine-clearing tank. M728 CEV: Combat engineers version, featuring a A-frame crane and winch, M135 165 mm (6.5 in) demolition gun, mine plough or bulldozer blade. M9: Dozer blade kit for the M60. M728 Combat Engineering vehicle with mine rake. 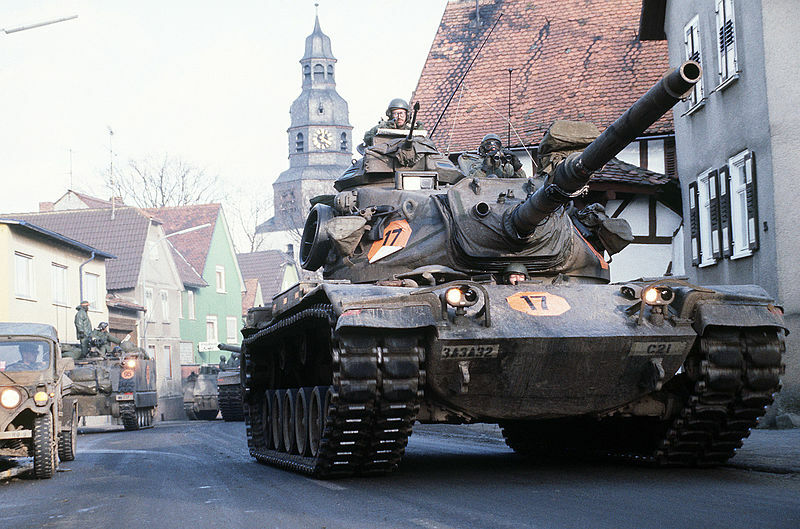 The M60 was kept for US service alone (although some were sent to Israel), whereas the M60A1 was supplied to U.S. allies, like Austria and Italy in Europe, Iran, Israel, and Jordan in the Middle East. The M60 is still used by the USAF for testing purposes. The M728 Combat Engineer Vehicle and the M60AVLB are also still in service. The Austrian M60A1s were rebuilt to the A3 standard by Steyr-Daimler-Puch in Austria. In the 1990s they were sold to Egypt. This country operates some sixty M60A3 to this day. 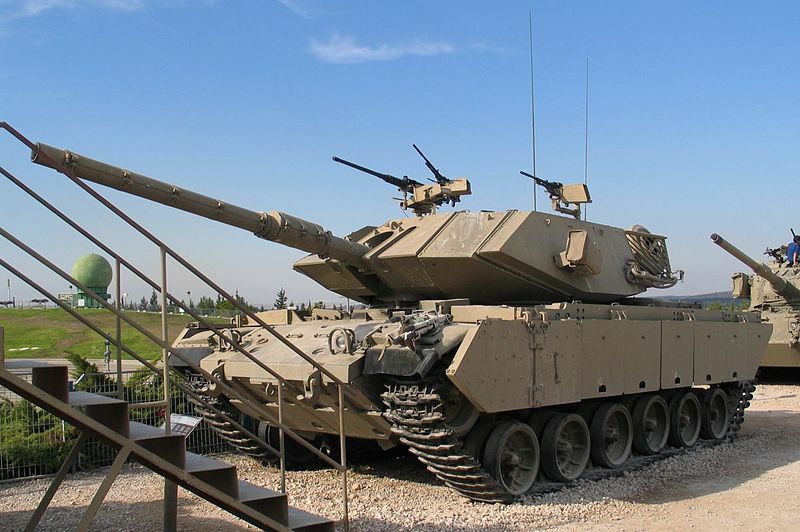 Eighty-five M60A3s were delivered in 2012. They are still in service. Ninety-one M60A3 TTS were purchased. They are in service today. This is currently the biggest user of this model, with 1016 M60A3s and 700 M60A1s. The Ethiopian army purchased an unknown number of M60 or M60A1. The Greek army received 357 M60A1 RISE Passive and 312 M60A3 TTS MBTs. They are now retired. The Israeli defense force operates some 711 Magach 6 Archuv and Magach 6 Archuv 2, and 111 Magach 7 as of today. They received extensive protection with ERA or passive armor. Older models were known as the E60 (M60), E60A (M60A1), and E60B (M60A3). 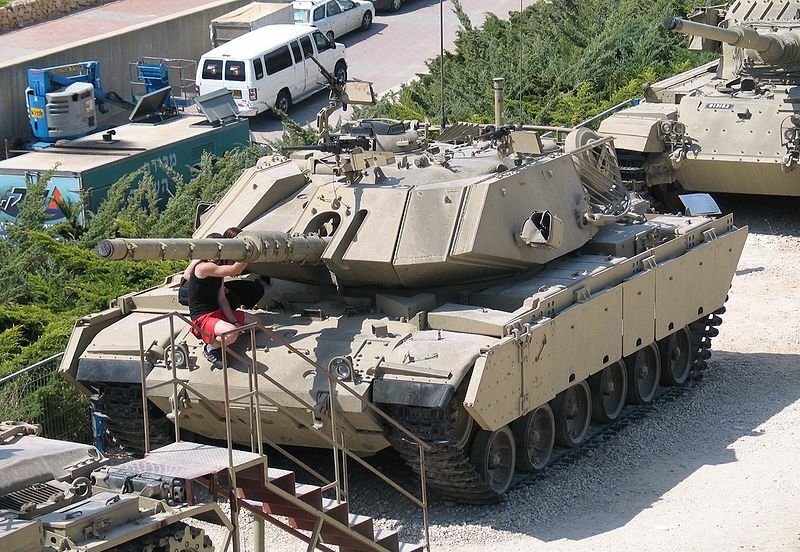 Israel also developed the M60 Sabra and the M60T or Sabra Mk.II. This is a highly upgraded M60A1 developed for the Turkish Army, with a new 120 mm (4.72 in) smoothbore gun, electric stabilization system, new FCS, and upgraded armor package. IDF E60A Blazer ERA at Latrun. 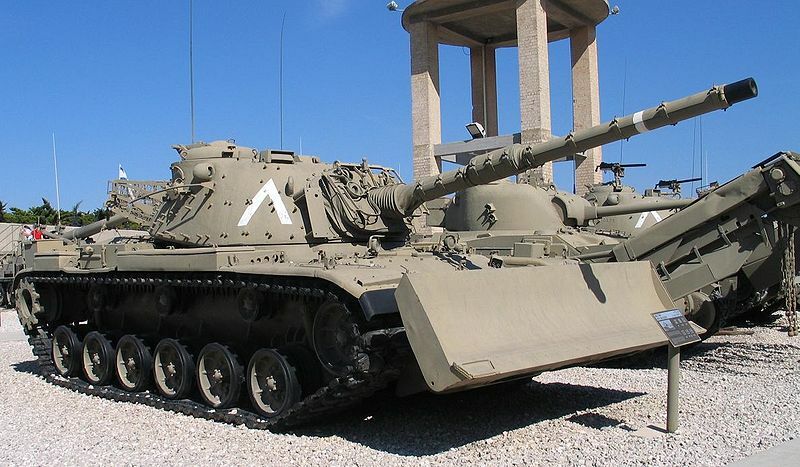 Italy produced 200 M60A1s under license at OTO Melara, and received 100 more, for a total of 300 in the 1970s. They are no longer in service. This country operates some 150 M60A1(as of 2010). In 1961, the first delivered defected, crossed the border, and was captured and studied by USSR. As of today, these tanks are in the process of being upgraded to the Samsan (Sword) standard. Locally developed, with some help from Russia, it includes ERA (Kontakt-5) protection, an EFCS-3 fire control system, a laser warning system and IR jammers. The Jordanian kingdom operates 182 M60A3s. The King Abdullah II Design And Development Bureau developed the Phoenix, a radical local upgrade which includes a 120 mm (4.72 in) RUAG smoothbore gun, shoot-on-move capability, and improved protection with ERA and side skirts. The number of conversions is unknown. 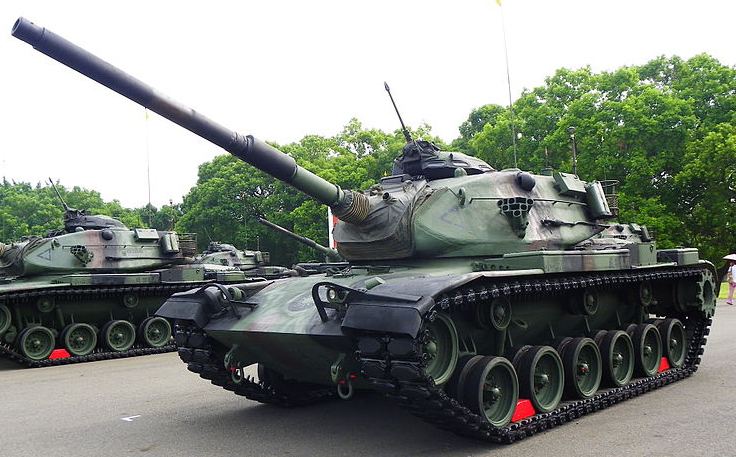 About 66 M60A3s were purchased in 2008, the first batch of ten was received on May 22, 2009. The Moroccan army operates a total of 260 M60A3TTS and 167 M60A3. The Omani army operates some 93 M60A3 tanks as of today. The Saudi Royal Army operates some 450 M60A1 and M60A3 as of today. Spanish Marines M60A3 TTS landing off during exercises. The Fuerzas Armadas Españolas received, in early 1990, around 300 M60A3 & A3 TTS (16 of them for the Marines) from Central Europe, according to the Treaty on Conventional Armed Forces in Europe (FACE), and 50 of the A1 version. However, the latter were worn out and did not have the spare parts required. 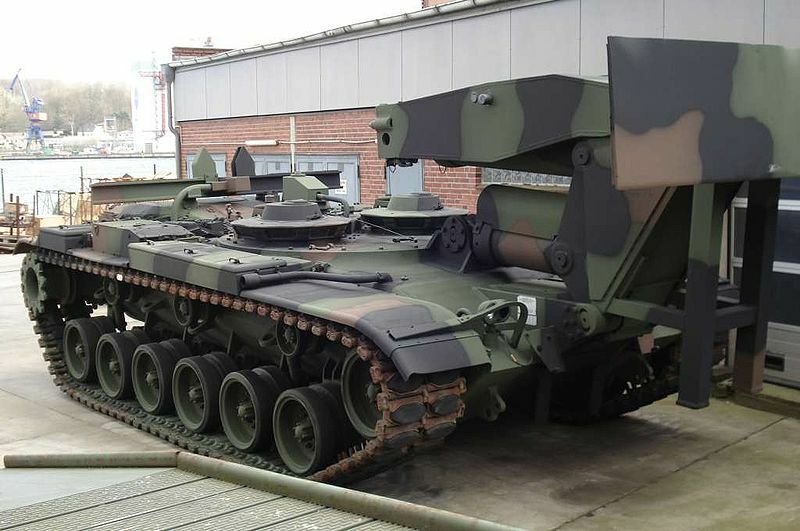 It was thought off applying the modernization program developed for the AMX-30E2 with a Hughes/ENOSA Mk.9A/D imager and FCS, MTU 833 diesel and ZF LSG 3000 transmission, but the perspective to acquire the Leopard II led to the cancellation of this project. The Fuerzas Armadas Españolas today use 16 M60A3TTS for the Marines (Infantería de Marina), 38 modified M60CZ-10/25E Alacran (combat engineer variant), and 12 specialized M60VLPD-26/70E (converted bridgelayer with the “Leguan bridge system”). 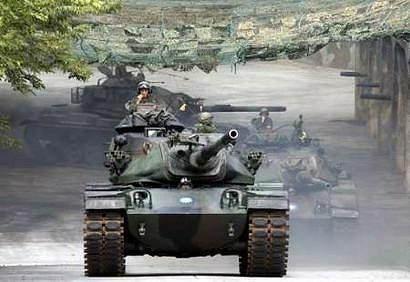 Fourteen M60A3TTS are in service today. In addition, six M60A2 had their turrets for training. The Taiwanese army operates some 450 M60A3 TTS as of today. 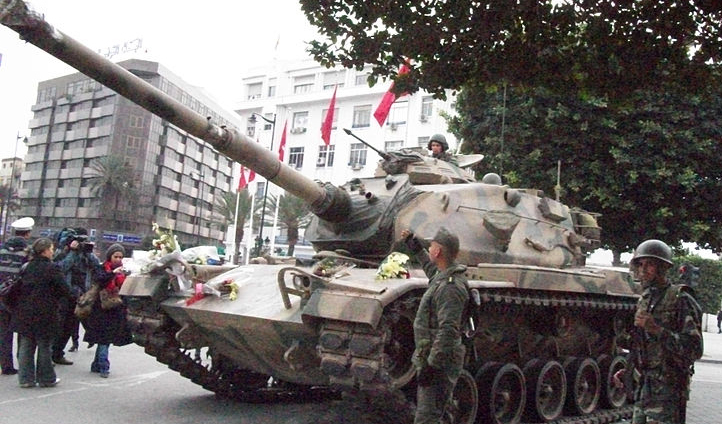 The Tunisian Army operates some 59 M60A3 and 30 M60A1. 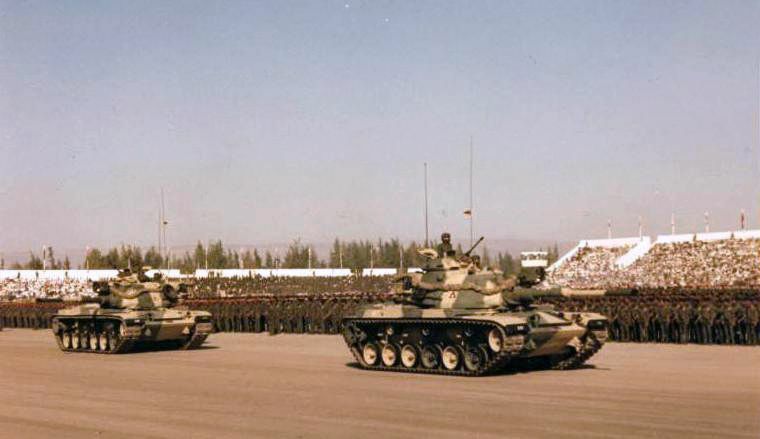 The second-largest user of the type (after Egypt), operates some 658x M60A3 TTS, 104x M60A1 RISE, and 170x M60A1 specialized variant the Sabra. 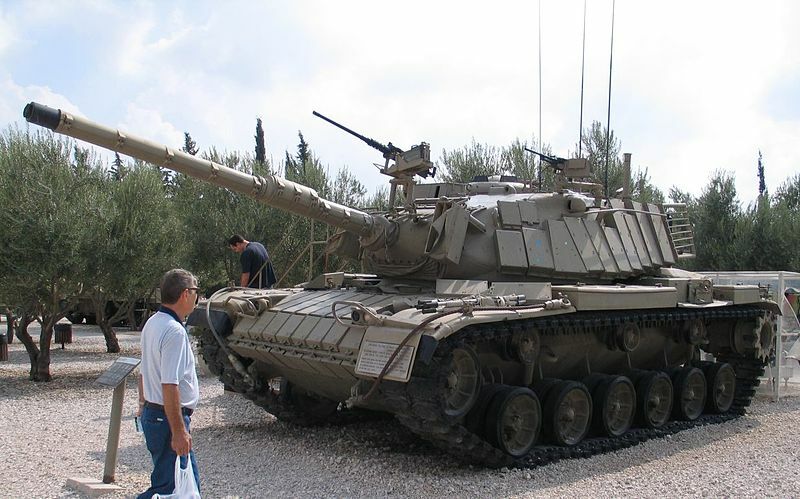 The Israeli Military Industries won a contract in March 2002 to upgrade 170 Turkish Army M60A1 tanks with the installation of a new 120mm smoothbore gun, Elbit Systems’ electric gun and turret drive stabilization system, including a new fire-control system and a new armor package. 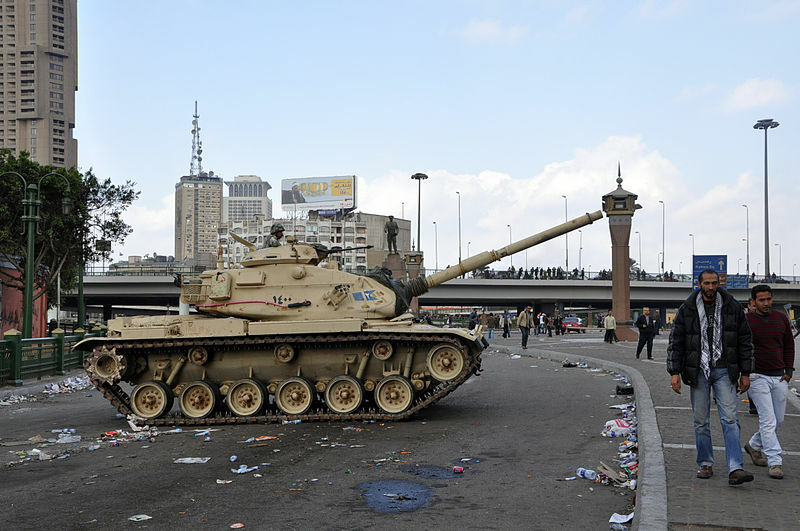 These upgraded M60A1 main battle tanks are also known as the Sabra MkIII upgrade. 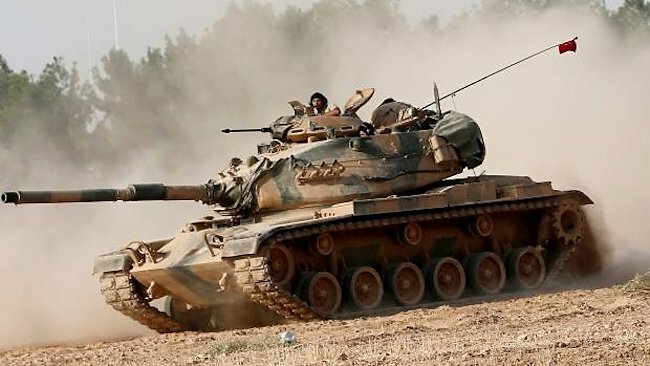 Turkish Army M60A3 tanks were deployed inside Syria after rockets were fired over the border in August 2016. The Yemeni Army operates some 240 M60A1 or A3. No other details could found. USAF M60 in Doha, Qatar. During Operation Desert Storm in February 1991, USMC’s M60A1 ERA rolled into Kuwait City after a fierce battle at the Kuwait Airport. 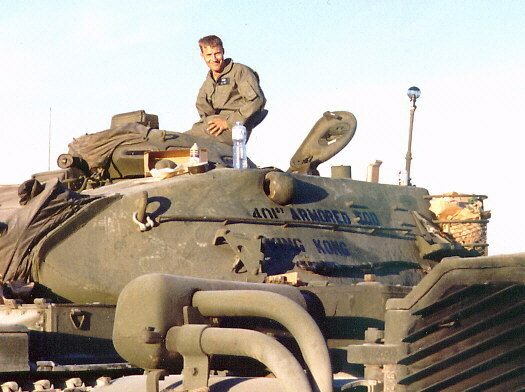 Some 200 participated in the largest tank battle for an USMC unit since World War Two, dealing with Iraqi T-54/55, Type 69, and T-72 tanks, north from Khafji. This unit claimed nine dozen Iraqi tanks destroyed for a single M60A3 lost. Only specialized variants were deployed, having a great deal of activity altogether in several sub-operations at tactical organic unit level, notably to create provisional bases and depots. 105mm Gun Tank M60 in trial markings, first pre-production run, 1959. 105mm Gun Tank M60 of the main production series in exercises in the 1960s. Camouflaged 105mm Gun Tank M60 used until the 1990s by the US Reserve or National Guard unit, now preserved at the Fort Lewis Military Museum, Washington. 105mm Gun Tank M60A1, early production version with the aluminium roadwheels, 1963. M60A1 with steel roadwheels in drilling exercises, fall 1960s. Iranian Samsan (Farsi for sword), locally-developed upgrade of the 1976-78 M60A1. M60A1, apparently used in exercises in the desert in the 1980s. M60A1 ERA of the USMC, battle of Kuwait Airport, February 1991. 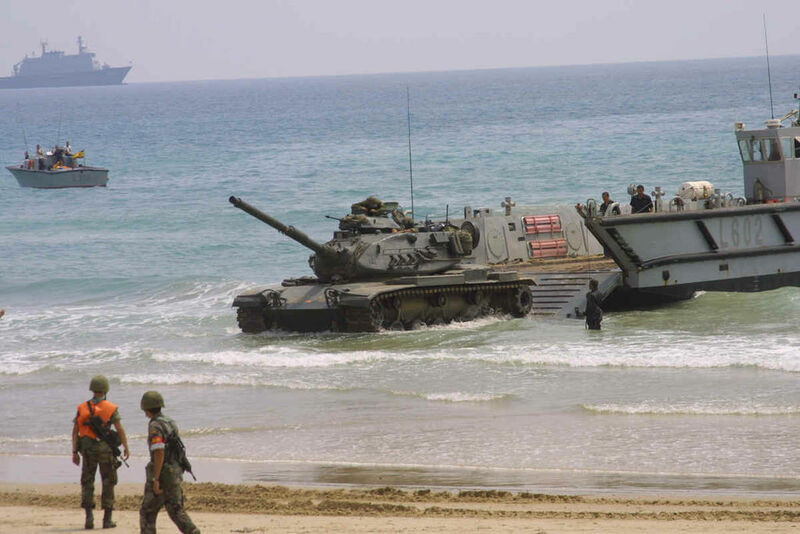 This was the largest tank battle of the USMC since World War Two. Libyan M60A1 in 2011. Notice the laser range finder and thermal sleeve. 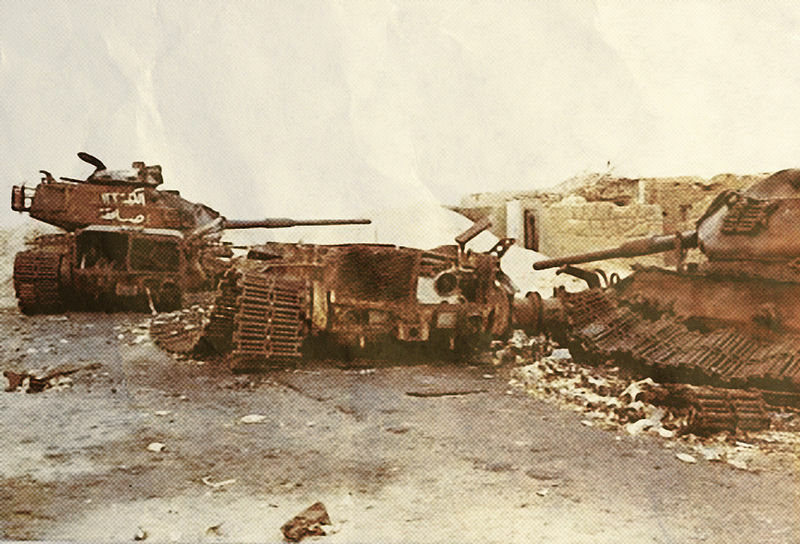 Egyptian M60A1, Operation Bright Star, 1985. 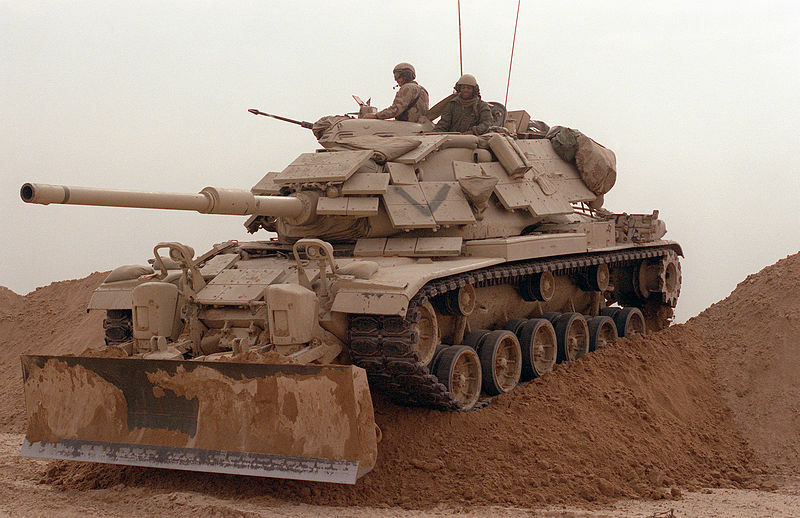 M60A1 RISE in the 1980s. M60A1 of the USMC, 1970s. M60A1 of the US Army in the 1970s. 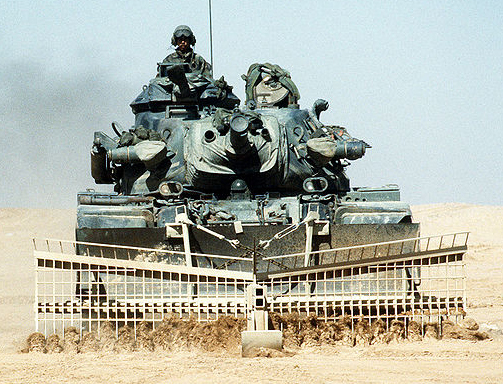 M60A3 RISE US Army Nevada, 1980s. 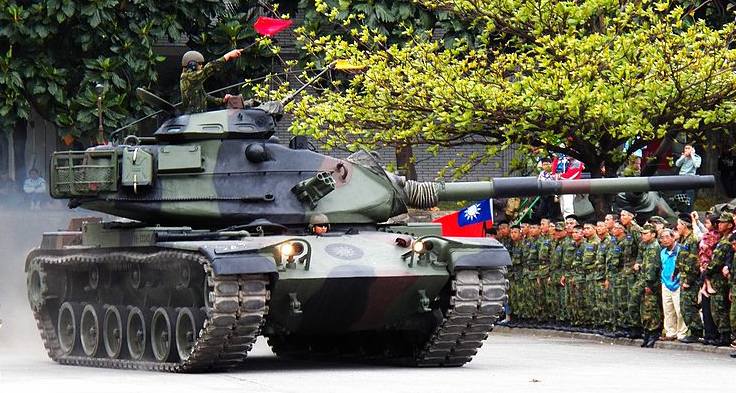 Taiwanese M60A3, during an exercise at the 58th Artillery Command. 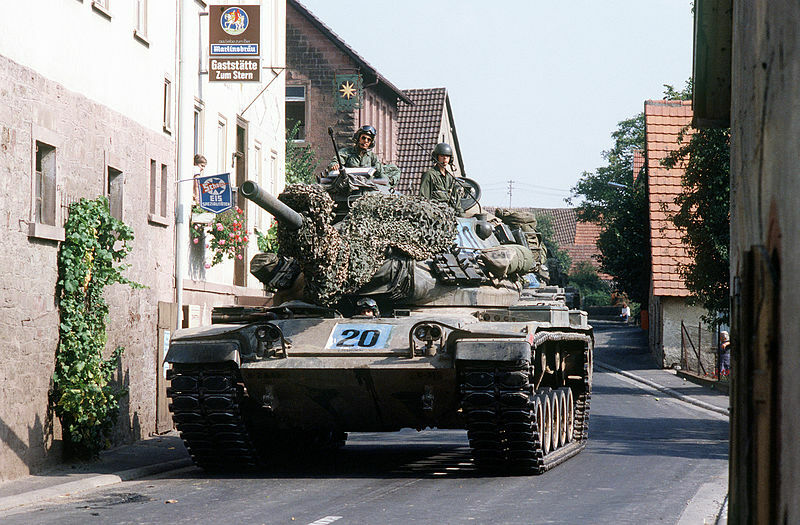 M60A3, 2/68 Armoured Regiment, 8th Infantry Division, Operation REFORGER 1988, West Germany. M728 CEV armored recovery & genie vehicle, US Army, late 1970s. Israeli E60A Blazer ERA, 1990. Numerous errors in the color profile captions. Photo of cupola at top is of M48 cupola, NOT M60. On all of the profiles the location of the return rollers is incorrect. The legend for the cupola was modified. For the return rollers after finding the right profile : http://i41.photobucket.com/albums/e291/Sgtscoutsout/Linked2AFV/M60A0visA1overheadview.jpg for the early M60 serie it seems indeed location was incorrect. It has been corrected and the profiles updated. Does the M60A3TTS have an escape hatch in the undercarriage. 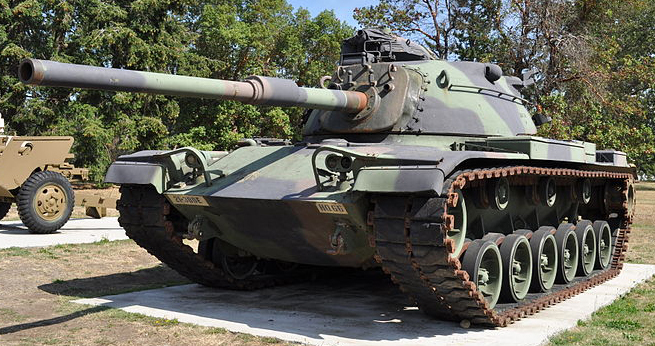 How does this tank compare to the Chinese CM11, which they claim is similar to our M60A3. Taiwan experienced a tragic accident when one their CM11’s slipped off a bridge into turbulent waters and landed upside down drowning 3 soldiers. The M60A3 has an excape hatch under the driver’s seat. It is affectionately known as “the bottlecap”. bottlecap? As a tanker we never used that term or for that matter never heard of it. I trained on this tank in 83, and served until 87, then we got transitioned into M1s. It was called the escape hatch always. Brasilian 91 tanks. em serviço…. As far as I know, The Libyans never used the M60A1. But one of the illustrations is of a “Libyan” M60A1 Patton (11th diagram from the top) with a laser range finder and thermal sleeve. Had no idea, thanks for sharing ! That is a VERY nice retrofit package. The Thai Army has done well with this old soldier! Looking at this photo image a second time: it looks like the Thai Army placed a modified M60 turret (different machinegun in the commander’s cupola) on a Commando Stingray chassis. Just wanted to clarify on the Libyan M60A1 (I don’t know if Libya had any or not- they certainly did not receive U.S. training!). That box like device over the main gun would not be a laser range finder unless it was somehow retrofitted. The M60A3-TTS had its range finder on the right side of the turret just below the commander’s cupola. It was inside of the blister formerly used for the stereo coincidence range finder aperature. Whatever that is on top of the main gun would more likely be a Xenon search light similar to what the German Leopard I used. Okay, I caught a mistake: this vehicle has a four-man crew, not five. There is no assistant driver. The driver’s compartment is in the center front of the hull with no placement for an assistant driver. Would like to clarify that the M60/A1/A3 are not exactly compatible to fire the M900, Only the M1 (105mm) and later Stryker were rated to shoot that round. They could.. but its strongly advised not to. M60 does not have a powerful enough Gun Mount or Hydraulic system to support the extra recoil from the M900. 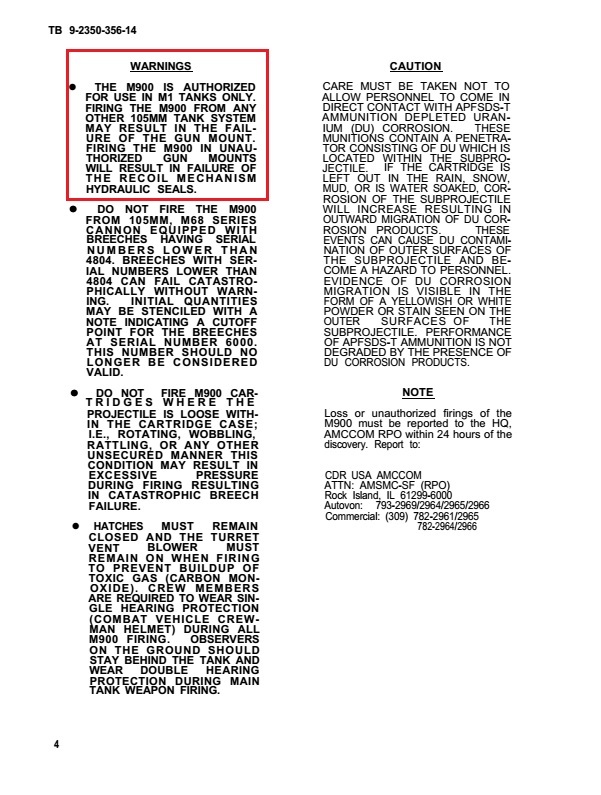 manual and documents warn against the use of M900 in any platform that wasn’t the M1. 1) specific Breech # is needed to be known before which M68a1 cannon M900 can fire it. I just wanted to say that the M60A1’s in Iranian service were nicknamed Samsons, not samsans. Samsan is not the farsi word for sword, it is a poor transliteration of the Iranian word of Samson, the Biblical hero. 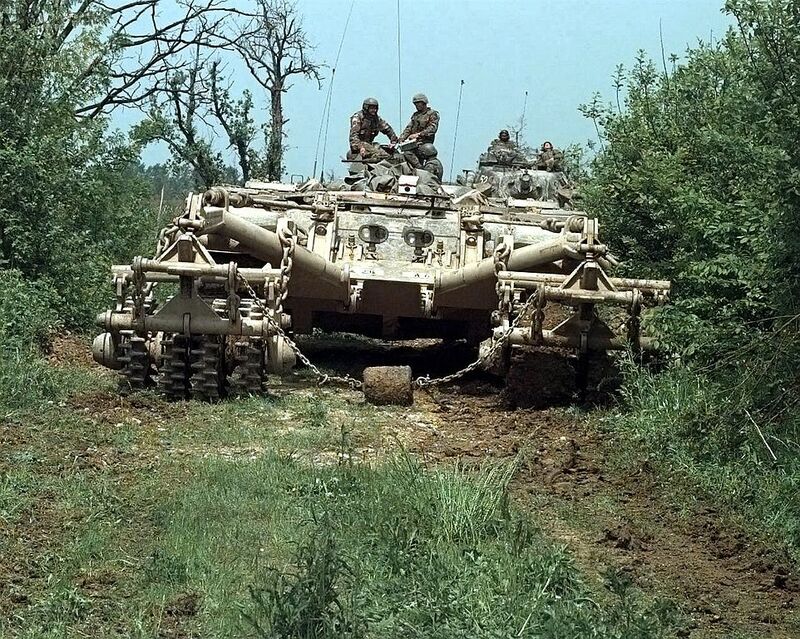 In army slang, calling their M60s Samsons was meant as calling them “Tough Guy”. The M60 turret was NOT the M48 turret. The M60 turret RESEMBLED and was derived from the M48’s, but the roof was flatter toward the rear. Somebody please show me that the Israelis EVER tested the M60A2. I have never seen any evidence of that. Sorry to be so blunt, but that last part on the M60/M1 is just so much BS. There is a lot of good info in this article, but some of these mistakes and BS don’t help it. Corrected the M48 turret phrase. As for the M60A2, that was a typo. Meant to be M60A1. Let me be more specific about the turret shape. The turret of which I am speaking is not the elongated one of the A1. 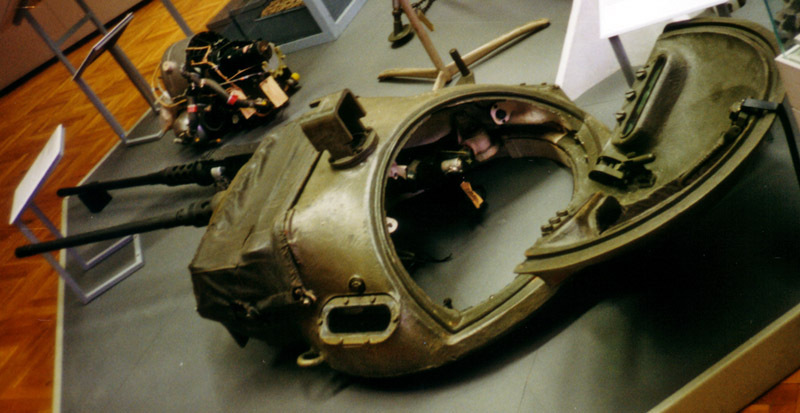 The first model, with the round shape was not as rounded as well he M48 turret. The top rear was flatter than the 48 before it fell off. We never used ‘bottlecap’ in the article. Article clearly mentions Patton seems to be unofficial. Removed all Patton references in the article except title and explanation. Article clearly mentions Starship to be unofficial. 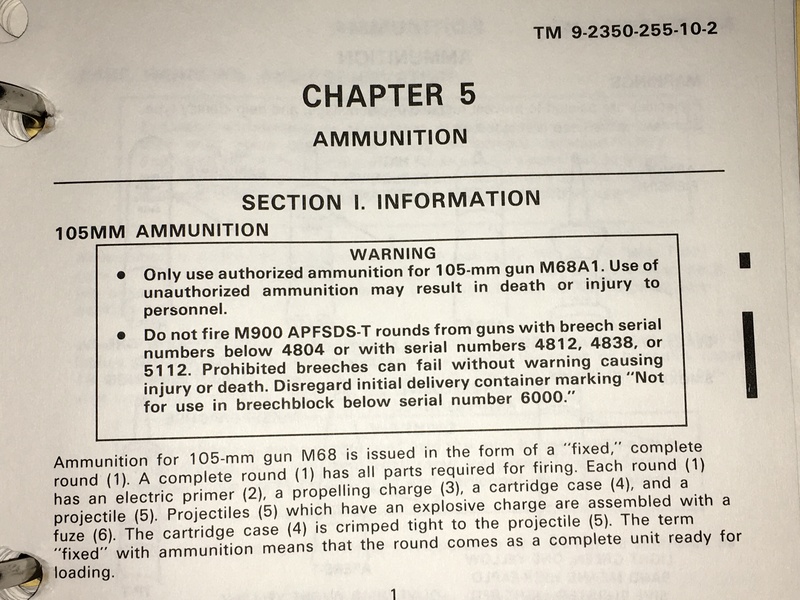 A quick question regarding the section that metions the M60A1E3. what scources are found that claim it has a 150mm (5.9 inch) gun so far i can only find that it was used to see if the M68 gun could be mated with the M60A1E2 turret. and this does seem to back up that atleast the M68 was considered.